For many buyers, price and weight are the first things to check when looking at caravans for sale. For some, however, these are less of a consideration than quality and longevity. 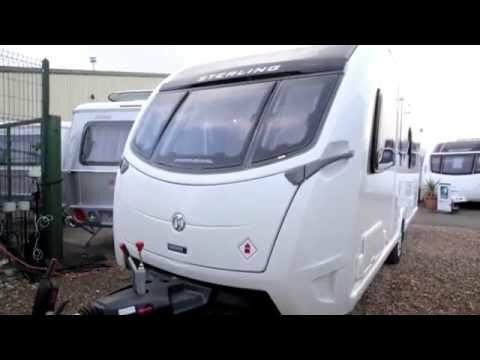 They are the kind of people who traditionally favour the products of Coachman and Hymer, but for the past year, you’ve been able to add Swift and Sterling to that list, with their matching top-of-the-line Elegance and Continental ranges. We had a Swift Elegance 570 on long-term test last year and were highly impressed; now we look at its identical twin from Sterling. The Sterling Continental 570 features the Swift Group’s entirely timberless SMART HT construction, and a packed specification that includes the ATC stability system, an AKS hitch stabiliser and shock absorbers for the Al-Ko chassis. There’s also programmable Alde wet central heating, heavy-duty corner steadies and an external 230V socket, plus points for a gas barbecue and shower. There’s even a 30-litre on-board water tank, a solar panel, plus pre-wiring for the motor mover that Swift expects most buyers to fit. Making the job of pitching easier still is a neat little spirit level mounted in the front shelf, visible through the front window. All of that kit adds weight, however, and the MTPLM of this caravan is 1700kg, putting it firmly into large SUV territory. Still, it’s a great-looking van, with one of the most stylish faces on the market thanks to that curved glassfibre front panel with triple windows and large sunroof, set off by discreetly sporty graphics and ‘Scorpion’ alloy wheels. Unlike the more muted trim of its Swift brother, the Continental makes a bold statement with its white leather-look locker lids, smoked-oak inlays and two-tone ‘Ronda’ upholstery. The sofas are a little short for entertaining and it’s a colour scheme that splits opinion among caravanners, but what is likely to be less divisive is the way this tourer feels inside. The 570 features a fairly traditional layout, with a front parallel lounge, a fixed nearside bed and a full-width end washroom, and it’s wonderfully bright and open. It also feels special, with a sense of luxury augmented by the brilliant variety of LED lighting, most of it dimmable so you can create the perfect atmosphere. Technophiles will be delighted by the pod on the front shelf that houses charging points for any device, with USB, radio jack, plus 12V and 230V sockets. Style has won out in the kitchen too, with an illuminated splashback and acrylic stone surface with underslung sink. It looks impractical in white, but is thick enough that it can be sanded and refinished if it gets excessively marked. As you’d expect for the price, the kitchen has all you could need, with a 110-litre fridge/freezer, a microwave, a dual-fuel four-ring hob and a separate oven and grill. There’s an Omnivent to get rid of cooking smells, too, plus a decent-sized worktop flap to boost food preparation space. There are no complaints about the washroom: it’s roomy enough, and features an electric-flush swivel toilet, a domestic-style heated towel rail, a large shower cubicle and a handsome vanity unit for the washbasin with a backlit mirror. There are plenty of storage options, too, not to mention a couple of speakers should you have a penchant for singing in the shower. We’re also pleased to see a frosted window, bringing in light without sacrificing privacy. The transverse island bed of the Continental 580 may be more fashionable these days, but this 570's layout undercuts it by a useful £1000 and offers a couple of clear benefits. Firstly, it leaves space for a deeper washroom, and secondly the fixed double is nearly 10cm longer, at a generous 6’3”. On the downside, if you’re by the window you’ll have to clamber over your partner to get to the loo in the night. You each get your own reading light, plus there’s a proper padded headboard and a television mount, and like all Swift Group vans it features a comfortable Duvalay mattress. This is traditionally a couple’s layout, but should you have a couple of guests the front lounge makes a large double, though at 5’4” each, the sofas are too short to use as singles for all but small children. There’s a good provision of overhead lockers in this Sterling Continental 570, plus useful bed boxes up front, but the main storage space is beneath the fixed double bed. It can be accessed from outside or from inside by lifting the bed on gas struts – just be careful not to create an uneven load on tow or to exceed the caravan’s 156kg payload. Other useful spaces include a sideboard on the nearside ahead of the bed, with a rather swish cocktail cabinet above, and a large wardrobe opposite the bed. Usefully, it has a sliding rather than hinged door, making it easier to access without the bed getting in the way. Additions to the kit list such as a standard Secure wheel lock and motor mover pre-wiring have increased the appeal of an already desirable van. We’d still issue a word of warning over the steep price-tag and its hefty weight, but come the end of our Sterling Continental 570 review, we reckon that the 570 is the sweet-spot of this flagship range. And if you can’t get to grips with the interior, you can always opt for its Swift Elegance twin.